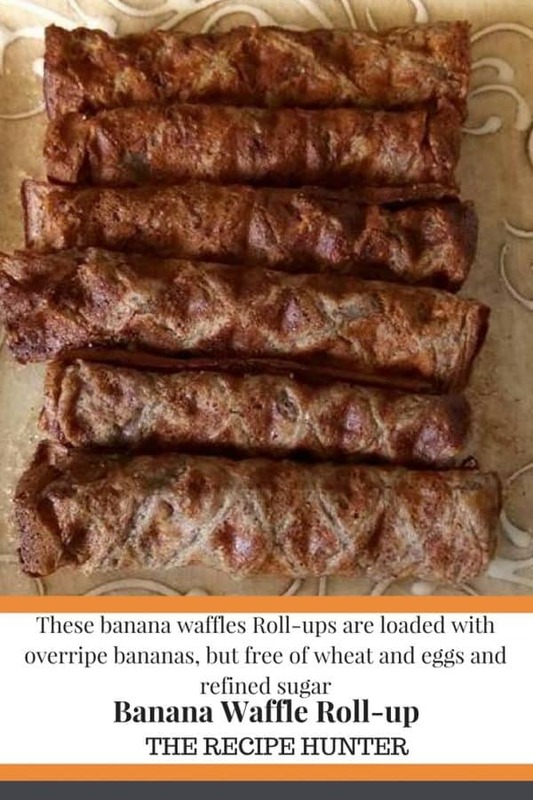 These banana waffles Roll-ups are loaded with overripe bananas, but free of wheat and eggs and refined sugar. Puree bananas with honey, milk, vanilla and adding lemon juice last. I like to use a soup spoon as a measure. Drop a generous soup spoon of mixture onto each waffle section and close. Don’t be tempted to overfill, it will get messy! My iron took 4 minutes to cook the waffles. The waffles will not be crispy. They will be soft and pleasantly moist inside. Remove carefully, I lifted each one over the end of a wooden spoon in order not to break. Lay on a plate and sprinkle lightly with cinnamon sugar while hot. Roll up while still hot because the edges will begin to crisp and then won’t roll neatly. A small amount of mascarpone as a filling enhances the flavors. *This recipe is enough for 20 roll-ups. **Free of wheat and eggs and refined sugar. How cool are these?! So much fun that they are rolled up! Hope you will enjoy it and try it out. Yummy. Banana makes everything better. We just love fruits for desserts.